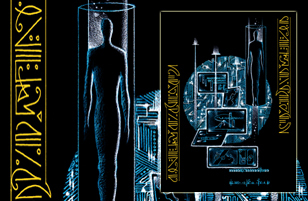 This image shows the recalibrated 3D to 5D human blueprint. 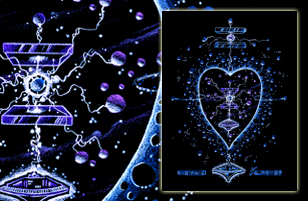 Currently many individuals on this planet are transforming on a molecular level and reconfiguring the 12-strand DNA structure and returning to the ‘perfection’ of the original soul blueprint. 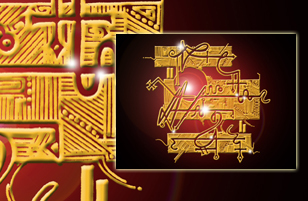 This transformation will result in a faster oscillation of the cells and energy field, allowing individuals to manifest magical skills and perform miracles in the new Golden Age. Our new bodies will not be prone to disease or aging, but always maintain a youthful, ageless appearance. Also, there is no elimination system in the new lightbody, as the faster oscillation of the Christed energy field consumes and quickly transmutes even the densest of substances. 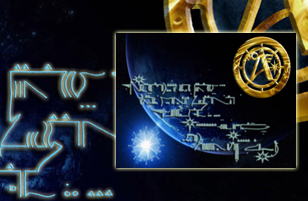 Among the many levels of assistance we have at this time are some very advanced, human-extraterrestrial cultures that have been monitoring and guiding humanity throughout the eons of time. These off-planet cultures belong to a larger ‘assistance league’ known as the Association of Worlds or Galactic Federation of Light. This Federation, which can be thought of as the ‘spiritual justice system’ of the universe, values all life and is always working toward fulfilling potential. They develop, organize and guide projects in all galaxies to assist all life forms, using both telepathy and dream communication. One of our primary assistance groups is the Pleiadians (Plee-a-dee-uns), who reside in the seven-star system known as the Pleiades. They can be thought of as our closest ancestors and look very similar to us, although they have evolved to a higher state of physical perfection than Earth humans. Because of the physical similarities, they are able to walk among us and assist without anyone taking notice. The Pleiadians, as with the other races, have developed their brain capacity to such a level that their consciousness skills (intuition, learning, creative) are far beyond our current capabilities. They work through the ‘love’ vibration, by raising awareness through art, music, healing and global education, thus helping humanity to gently break free from many of the controlling and oppressive 3D constructs/institutions. Cultural Characteristics: Telepathic Peace Ambassadors, Global Mediation & Systems Resolution, Creativity & Magic, Mind/Body Healing Connection. Cultural Characteristics: Planetary Terra-Forming, Magnetic Science, New Pyramid & Structure Creation, Advanced Sexuality & Creativity, DNA Healing. One of our primary assistance groups is the Orions (Oh-rye-uns), who reside in a prominent constellation located on the celestial equator. Their star cluster is one of the most visible and recognizable in the night sky worldwide. 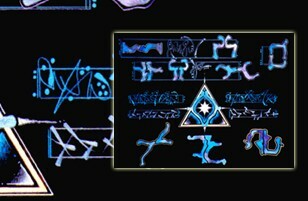 The Orion culture is best known for manifesting the kingdom of Camelot on Earth hundreds of years ago. 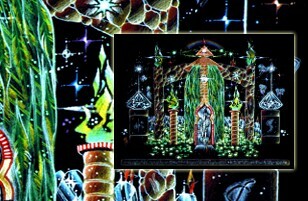 This seeding included the arrival of Merlin, King Arthur and the Round Table Knights from Orion’s brightest star, Rigel. The physical characteristics of their race vary slightly, but most have tall, thin bodies adorned with beautiful tattoos & body piercings, long, straight dark hair, opalescent eyes and light skin. The Orions are descended from the ancient Lyrans, but their soul history can actually be traced back to the Destroyer and Carrion Angels as well. The difficulties they have faced in their home constellation are many, including unending galactic wars and planetary takeovers by malicious & dangerous intruder races, such as the Reptilians and Tall White Greys. They are strong warriors who are determined to preserve the light and history of their race and eventually gain control of their home world once again. For the first time in millennia they are incarnating in-mass on Earth to strengthen their genetic coding and clear karmic imprints from the distant past. You will recognize them by their physical characteristics and their strong personalities, although internally they are very sensitive, caring and loyal individuals. 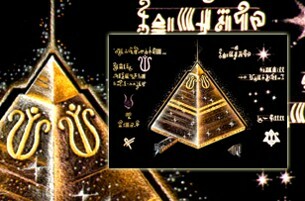 The Orions are assisting us by shattering illusions and deleting negative overlays within the global matrix system. They are also bringing new ideas for self-empowerment through unique individual soul expression and mental/emotional inner strength training. Cultural Characteristics: Group Collective Consciousness, Balanced God/Science Technologies, Creativity & Music, Energy Healing, Heart-Based Sexual Connection. One of the many new sequels to the pyramids built in Egypt and Atlantis; promotes new creations in both the physical and etheric worlds; the embodiment of harmony and modern day alchemy; penetrates the inner sanctum of the heart and brings a new understanding of unity; contains knowledge of astronomy, both ancient and new; a living structure, a place of contemplation and wonder. Alchemical elixir used in ceremonies in ancient Egypt and the Sirius Star System; represents the liquid gold light of Christ Consciousness; initiates the process of automatic writing, channeling and intuitive perception. 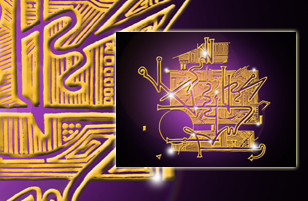 ‘Ark of the Covenant’ fire-letter sequencing; accelerated ‘energy ribbon’ codes which spin quickly in, through and around the body, enabling the recipient to activate and integrate their Higher Self and Lightbody; promotes inner radiance and cellular regeneration. 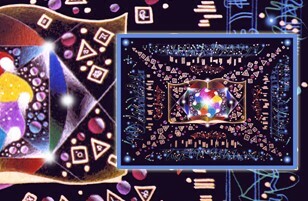 Allows one to easily assimilate multidimensional energy and information; promotes clarity and clears misperceptions regarding one’s emotional and mental processing; initiates acceptance of the new paradigm operating systems (including new social, financial, medical & educational); activates ancient temple sites, vortex points and grid systems. Lemurian telepathic Language of Light, brought into form through the alchemy of the human voice & heart; awakens solar-body consciousness; manifests the reflection of two existing worlds, Heaven and Earth; releases linear thinking and promotes clear communication. This elemental alchemy template helps to redesign your perceptions of who you are and what your potentials and possibilities are in this lifetime. This ‘fan of rainbow energy’ will begin to awaken within you unlimited options and thought forms, ultimately bringing you into alignment with the highest potential path and timeline grids of your bright & wondrous future. Re-align, connect, decide and proceed! 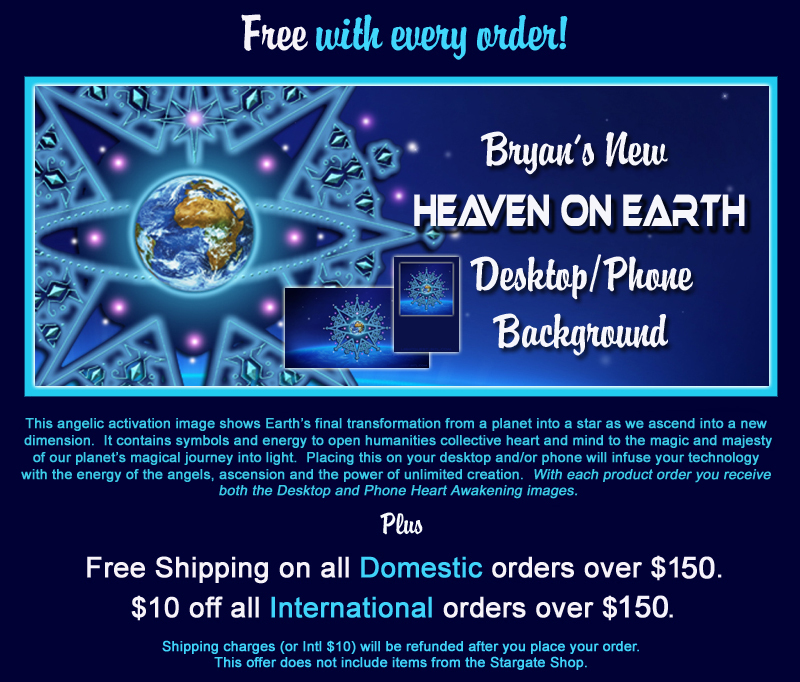 New holographic angelic-energy matrix specifically designed to assist in a mass awakening of humanity by sending energy, healing, blessings and assistance to those in need. Each matrix is transferred from person-to-person instantaneously, assisting the recipient in a number of ways. To use, visualize the matrix in the palm of your hand and then energetically send it from your hand to the other individual’s body. 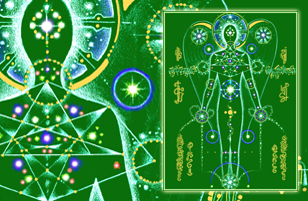 Subsequently, the individual’s Higher Self will unlock the matrix and help them integrate the energy as needed. They can be sent to people in any location and in any situation: shopping malls, restaurants, movie theaters, concerts, sporting events; wherever you see people who need help. Sending this matrix to an individual will help them with the following: Relationship difficulties, legal problems, financial problems, accident or emergency situations, job issues. 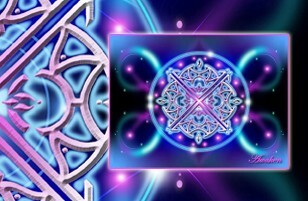 Sending this matrix to an individual will help them: Spiritually awaken; open the mind to new possibilities & bring new awareness of multidimensional concepts and realities; accelerate higher 5D, 6D and 7D thought processes; enhance connection with their destiny path; connect with spirit guides, Ascended Masters, angels or galactic beings. Sending this matrix to an individual will help them with the following: Clear confusion and promote mental clarity; heal emotional problems; clear stress-related problems – overindulgence, addictive behavior, etc. ; promote Higher Self alignment; clear scattered-ness and ungrounded-ness; alleviate indecisiveness. Sending this matrix will assist: Individuals in hospitals and rehabilitation centers; people who have physical difficulties and injuries; elderly and the handicapped; individuals in auto accidents. 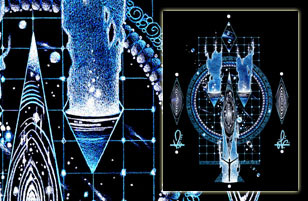 This powerful transmitter and receiver, created by utilizing ancient Atlantean esoteric knowledge and technology, activates one’s ‘Vril Force’ and true power; quickens manifestation and releases limitations within the body consciousness; represents the empowerment, fulfillment and mastery of Spirit. Activates one’s power as a co-creator and steward of Earth; enhances meditation and deep-trance states; promotes internal introspection & contemplation; assists in the manifestation of one’s mission & purpose; promotes focus and clarity, renews one’s mind, body & spirit. 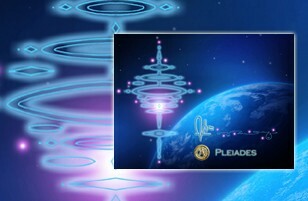 One of the primary assistance groups is the Pleiadians (Plee-a-dee-uns), who reside in the seven-star system known as the Pleiades. They can be thought of as our closest ancestors and look very similar to us, although they have evolved to a higher state of physical perfection than Earth humans. Because of the physical similarities, they are able to walk among us and assist without anyone taking notice. The Pleiadians, as with the other races, have developed their brain capacity to such a level that their consciousness skills (intuition, learning, creative) are far beyond our current capabilities. They work through the ‘love’ vibration, by raising awareness through art, music, healing and global education, thus helping humanity to gently break free from many of the controlling and oppressive 3D constructs/institutions. 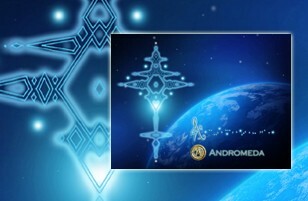 One of the primary assistance groups is the Andromedans (An-drom-a-dans), who reside in the nearest major galaxy to our own Milky Way in a cluster of stars known as the Andromeda. They are 6th and 7th dimensional advanced human extraterrestrials who are most active in facilitating Galactic Council/Federation meetings and making important decisions regarding the current situation here on Earth. They promote peace education and improved global governance, while providing innovative strategies for resolving conflict and exposing elite control and manipulation. They are also very involved in educating the youth and work directly with the indigo and psychic children to enhance and protect their gifts. 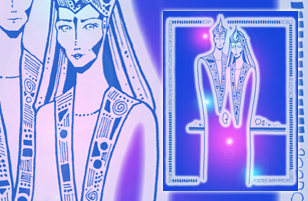 The Andromedans are peaceful communicators who use telepathy and physical contact to help humanity evolve and grow. 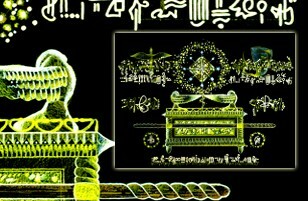 They are also the masterminds behind the crop circle phenomena. 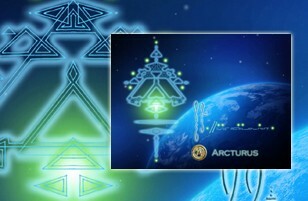 One of the primary assistance groups is the Arcturians (Ark-tour-ee-uns), who come from a star-field known as Arcturus. Within the Arcturian consciousness, there are both physical (human) and non-physical (angelic) beings. Their home is often known by many as the ‘Planet of the Angels’ as they can be felt as a presence, an inspiring rush of creative energy or a deep feeling of spiritual connection and revelation. 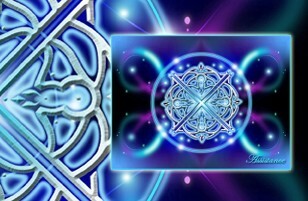 The Arcturians are helping to provide us with strategic advice in transforming our planetary systems and integrating/balancing spiritual values with advanced technologies. They are also helping to transition our current global financial, political and societal systems while coordinating and cultivating closer relationships between Earth humans and many other advanced extraterrestrial races. 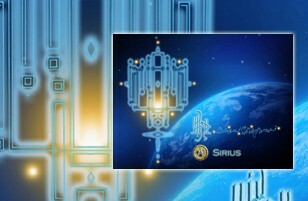 One of the primary assistance groups is the Sirians (Sear-ee-uns), who reside in a binary star system known as Sirius or the Dog Star, within the constellation of Canis Major. 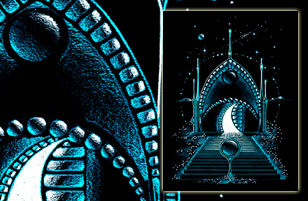 They have been a strong guiding force in the development of many major civilizations here on Earth such as Egypt, Maya and Sumeria; giving each culture advanced medical, astronomical and alchemical information, much of which has been lost through the ages. 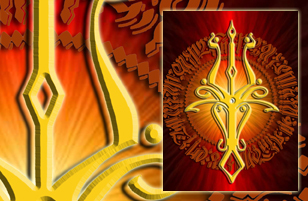 The Sirians are currently engaged in many global contacts with humans relating to environmental protection and raising human consciousness through innovative methods. 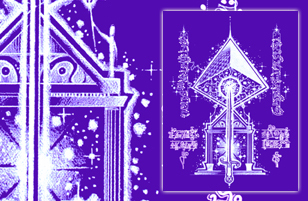 Ethereal healing temple connected to Hawaii & Lemuria, under the guardianship of the 4D Elemental Kingdom; brings flow, balance and harmony to overstressed mental, emotional and physical circuitry; energizes the chakra system and etheric body with flora and devic frequencies. A gentle breeze…a soft touch on the forehead…a feeling of warmth and safety…subtleties of the Fairy Godmother, felt only by the true believer and inner soul-searcher. This image beckons those wondrous, magical, childhood memories and night visions which are always preceded by a visit from this enigmatic, nurturing, all-loving being of light. Allow this image to enter your heart and prompt it to open wide, filling with all the love of God’s creation. See yourself as a special, unique child in the eyes of God, deserving of all the gifts of His glorious kingdom here on Earth. Meditating and working with this Third Eye Activation matrix will jump start your extra-dimensional vision and begin to dissolve many of the etheric veils which are prohibiting you from seeing the invisible. The following information and technique will accelerate this awakening. Visual-Imaging Technique: Begin by looking at this image for a few moments, then close your eyes and try to see the image as clearly as if your eyes were open. This may take a few tries, but you will get it. As simple a task as this may seem, what this is actually doing is projecting the imagery into your mind’s eye and prompting the awakening of your ‘Third Eye’ vision. You can actually do this with anything, such as an inanimate object or a person’s face. 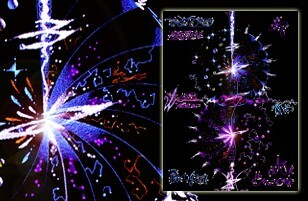 However, this image is also an accelerator, which will expand your multi-dimensional vision exponentially. 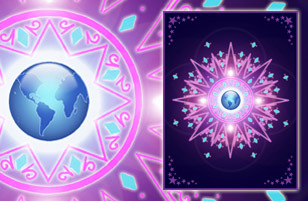 The two primary side-by-side images in this Third Eye Activation Template should be viewed simultaneously, first with your physical eyes; then with your eyes closed, through your Third Eye. Practice the visual-imaging technique with this picture as much as possible in order to bring more clarity to your extra-dimensional vision. Each and every day ongoing, live, streaming, galactic transmissions are being sent via secure telepathic channel to all Earth and off-planet ambassadors from the Ashtar Command and Brotherhoods of Light. 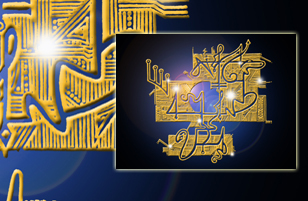 All transmissions carry the ‘Christ Seal’ and resonate at the highest level of consciousness. These multi-level (and often complex) audio-visual signals are received and integrated easily by all beings who are working in alignment with the greater plan. These signals will vary slightly, depending on whether the message being sent is of a more general or personalized nature. When one connects with these transmission accelerators, they give the recipient the ability to see and integrate these communications on a more conscious level. This ‘Call to Action’ signal transmission helps one to receive the higher protocols and align with the tasks at hand in order to help create what will be ‘Heaven on Earth’. This leadership signal includes different levels of information for all ground crew and airborne command divisions, including contact point coordinates as well as various dispensation and assistance details. 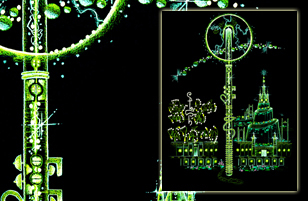 Connected to the airborne division of the Brotherhood of Light, this starship configuration will trigger a four-fold ‘Christ Light’ signal infusion within your mind and heart. This will lift your thoughts and emotions, allowing you to perceive, on occasion, 4th and 5th dimensional manifestations with your 3D eyes. This includes angelic, elemental and galactic activity within our sphere of existence. The commanders associated with each ship are as follows: Ashtar (blue) / Athena (pink) / Soltec (green) / Korton (orange). This ‘Telepathic Healing’ signal transmission is often sent to many representatives, particularly those on Earth who are furthering the larger mission. 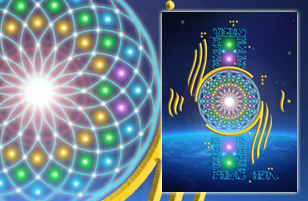 The healing frequencies contained within the signal are for the mind, the body and the emotions; helping one to remain grounded as well as mentally and emotionally aligned, while allowing the body to remain in a balanced state of overall health. 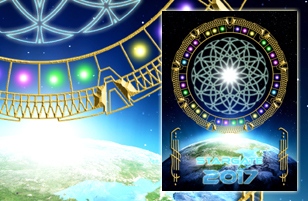 This ‘Celestial Event’ transmission is a regular monthly broadcast containing both astronomical and astrological information regarding planetary and star alignments related to shifts in consciousness here on Earth. This includes specific sacred vortex activations, crop circle decryption codes and special ‘celestial infusion’ event dates. This transmission is always updated and will keep you up-to-speed regarding all significant interdimensional happenings. Cellular template clears out old patterning & detoxes the body; initiates DNA activation through the Master Cell; sets up new cellular light patterning and youthens the body. This ‘Evacuation Signal’ is a preliminary warning transmission which is sent when there are impending natural or ‘dark-side’ scientific or military related disasters. These can include earthquakes, hurricanes, tornadoes, meteors and all types of transportation threats, in addition to dangerous military maneuvers and risky scientific experimentation. When this transmission is sent, it serves to put the ground crew on alert, giving us potential timelines and locations where the command ships (on stand-by) will be located to lift all Earth personnel to safety. The signal is often sent to specific personnel, leading them away from certain locations and offering alternative travel options. This signal is extremely high frequency and is accompanied by an electronic humming sound and verbal transmission. 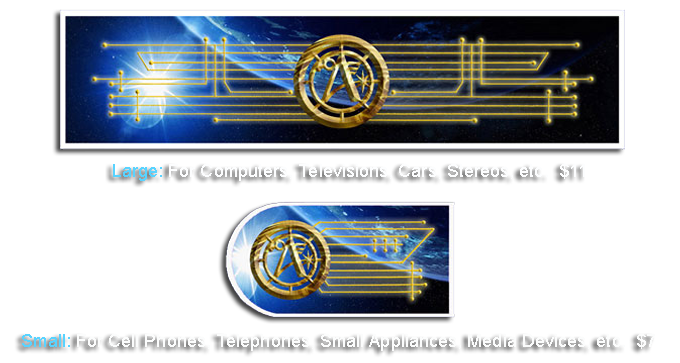 Allows an individual to be contacted and ‘beamed-up’ to the ship in the event of a disaster or other emergency situation; an energetic locator that allows the signal bearer to be found by the Ashtar Command ships anywhere on the planet, when direct contact and teleportation to a ship is necessary; an ancient Earth stargate symbol used for transport to other galaxies and dimensions; enables one to receive personal telepathic transmissions and important key information including current planetary updates from the Command. In order to embody the locator transmission, it is important to clearly visualize it and feel it in your mind & heart each day to keep the signal strong. 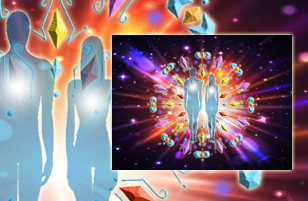 Interdimensional ascension template using higher knowledge and energy matrixes to create accelerations in consciousness; a new extra-dimensional accelerated learning curriculum for Earth; helps one to focus and prioritize. 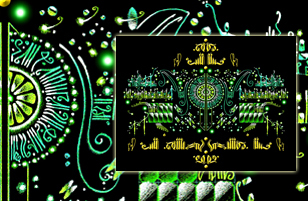 Linked to St Germain, Melchizadek and the Andromedan Council, this image allows the Higher Mental Body to over-light the lower mental processing system. This promotes quicker accessing and processing of new ideas and creativem multi-dimensional thought formulations, while releasing tedious, stressful over-processing within the mind. Visualizing this matrix within your mind each day will engage the higher mind and begin dissolving the lower negative thoughts and mental coping mechanisms. 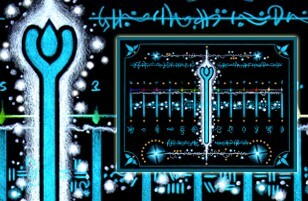 This accelerator activation circuit is a fusion of both ancient esoteric and modern ‘divine’ alchemy. It cleanses the 1st chakra (located at the base of the spine) and recalibrates the energy in that area to its original powerful state. This matrix will also defuse and delete any current or past-life mental or verbal curses, returning prosperity, healing and confidence to the individual. 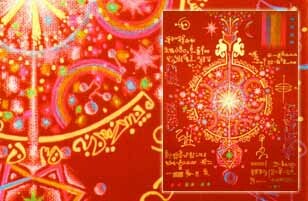 To use, visualize this image within the 1st/root chakra at the base of the spine. State the verbal intention below while moving your hand in a clockwise circular motion about 5 inches in front of that chakra. Visualize a brilliant red-velvet color spinning in that area of the body…cleansing, upgrading and refining the energy. I AM the eternal White Flame of the Immaculate Concept! 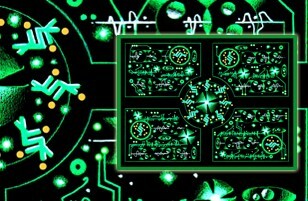 This accelerator activation circuit is a fusion of both ancient esoteric and modern ‘divine’ alchemy. It cleanses the 5th chakra (located in the throat) and recalibrates the energy in that area to its original powerful state. This matrix will also defuse and delete any current or past-life mental or verbal curses, allowing one to speak the truth with confidence and divine wisdom. 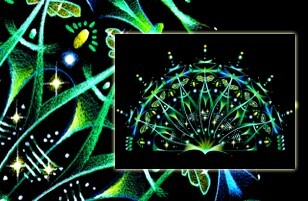 To use, visualize this image within the 5th chakra. State the verbal intention below while moving your hand in a clockwise circular motion about 5 inches in front of that chakra. 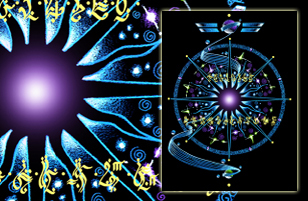 Visualize a brilliant deep-blue color spinning in that area of the body…cleansing, upgrading and refining the energy. I AM the voice and the will of God! 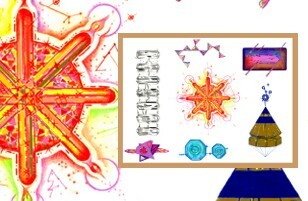 This accelerator activation circuit is a fusion of both ancient esoteric and modern ‘divine’ alchemy. It cleanses the 6th chakra/Third Eye (located just above the brow) and recalibrates the energy in that area to its original powerful state. This matrix will also defuse and delete any current or past-life mental or verbal curses, returning psychic sight and intuition to the individual. 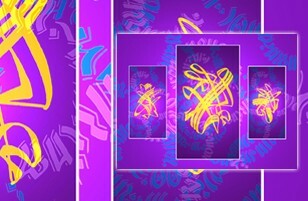 To use, visualize this image within the 6th chakra. State the verbal intention below while moving your hand in a clockwise circular motion about 5 inches in front of that chakra. 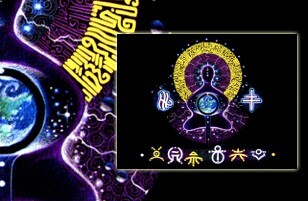 Visualize a brilliant purple/indigo color spinning in that area of the body…cleansing, upgrading and refining the energy. I AM intuition in action, inner guidance is leading me now! 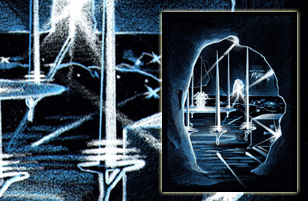 A mysterious cave with many super-luminal anomalous light sources…an open chest adorned by a Templar cross…a floating table with a strange glowing geometrical object in its center, surrounded by a circle of levitating swords…a brightly lit magnetic doorway in the background beckoning you forward. What can it all mean? This drawing is basically a “psychic photograph” which I rendered as I was remote-viewing various locations about a year and a half ago. Before I entered the vision, I asked to be shown the current location of Cup of Christ. Instantly, I arrived here, in this secret underground chamber and began to explore for myself its hidden secrets. By meditating with this image, you too will be able to gain access to long-lost secrets and mythical artifacts only known to a precious few. 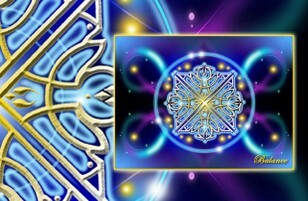 A Divine Twin Ray and Soul Mate ‘celestial beacon’ matrix connected to Lord and Lady Sirius and the Pleiadian Ambassadors; assists all who are desiring to connect with their divine partners, destiny work companions and lifelong unconditional friends; brings the frequencies of superluminal light and celestial love into the heart; initiates ethereal and physical connections between people in all dimensions; opens remote communication and telepathic dialog between planetary Soul Mates and Divine Twin Flames. Millions of individuals all over the planet are now taking part in a global movement to heal the Earth and awaken the masses in the last days before ascension. Working with us in this united effort are the Ashtar Command and the Ascended Masters, along with many legions of angels and illumined beings of light. This image provides inspiration, as well as a focal point, for this global healing and offers a transmission from the Federation for all of humanity. If you would like to be part of this activity of light, you can connect each morning with the Earthstar Global Ascension Team by focusing your energy and saying the following affirmations. 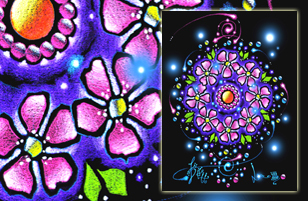 This will allow you to feel a united connection with others of like mind, boost your own spiritual power and know that you are truly making a difference! I am now dissolving all opposing energies and thought-forms that are not working in alignment with humanity’s highest good. As I continue through my day I send the White Light forward ensuring clarity, inspiration, joy and prosperity for myself and for all who cross my path! 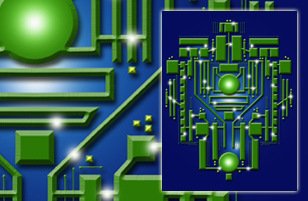 New “upgraded” circuitry for brain, which expands ones awareness of the energetics of money and all forms of exchange; assists transformation of poverty to abundance consciousness; releases fear of survival from the emotional body; reorganizes ones priorities in the business world; brings justice & order to material world; lays new foundation for the transfiguration of money energy; escalates one into freedom and sovereignty; connected to the Higher Planetary Councils of Earth and Andromeda. A new template for the expanded spiritual, philosophical and academic teachings, which is comprised of a full spectrum of color and harmonics; this image assists in grounding, expanding and connecting one’s teachings to others in the physical world; brings a renewed interest in 3D Earth schooling systems and gives all children a vision of the bright future; reorganizes the infrastructure of mental body to accommodate the new 5th, 6th & 7th dimensional physics; the central color wheel awakens memory of home and purity; connected to the Lemurian Mystery Schools and Serapis Bey. 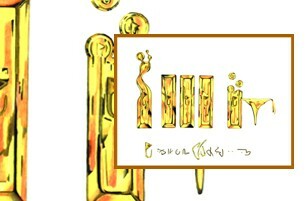 Guided by the 12 Universal Divine Flames, this new template represents the restoration of true justice, integrity and excellence on Earth; it is a distinct new rhythmic structure, an electrical scale of law system encodements, whose components have been anchored through ancient tribal councils and ceremonial dances; the central symbol, the Law of One, unfolds anchoring the 12 primary Universal Laws into the planetary consciousness; this image is symbols promote concern and compassion for humanity and holds important keys to the transformation of the body; protects one against manipulative deceptive activity in the legal arena; meditation on this image will decipher modern-day legal contracts and dissolve agreements and commitments no longer in alignment with one’s highest good; connected to the Ascended Masters and the Spiritual Hierarchy. 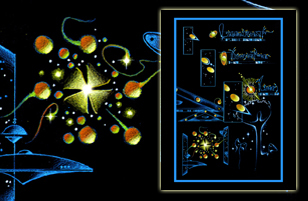 A reminder of positive collective consciousness, unification and of many working together toward the same goal; ignites the 9th body, the Electron Body, through the heart; gives one the ability to observe and connect with different facets and dimensions of all galaxies throughout all of creation; opens a person to be able to observe important events relating to and impacting Earth. 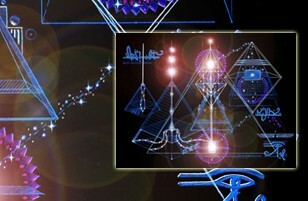 Connected to the Celestial Hierarchy, Isis, Hercules and Pallas Athena; represents the point of passage from 3D Human into Divine 5D Planetary Ambassador; holds the protocols, mission specifics and directives of the Divine Plan; reverses misaligned thought processes regarding spirituality and emotional integrity; cleanses and balances the 3rd and 4th chakras and endocrine system; synthesizes all complimentary ideas and concepts within the mind; enhances clarity and promotes positive thinking. 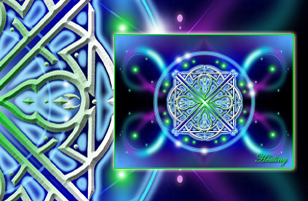 Enhance Creative Designs, Projects & Plans: The Divine Element #95, Pleiadian Light Matrix #123, Blue Starfire #126, Merlin’s Alchemical Grid #144, Geometry of Divine Creation #274. Heart Chakra Activation: Temple of the Heart #15, Dragon Power #48, Fire in My Heart #98, Heartsong #108, Mighty Heart of Fire #183, Piercing the Jewel #79, Shamrock Magic #207.